The August Blitz, held on Thursday 30 August, again attracted a good mix of regular attenders, newcomers, and people returning after several years’ absence (during which, it seems, life had got in the way of chess). Yet when the dust settled the prize winners were a fairly familiar bunch. First prize went to Pete Morriss, with six points out of seven; second to Andrejs Kozlovs (no longer eligible for the grading prize) with 5½; and the grading prize to James Blackwell, who also came third equal with 4½ pints. Our August Blitz tournament will be held on Thursday 30 August in the Bridge Centre (upstairs), St Mary’s Road. Please be there by 7.45 for registration. There will be an entry fee of €5 to cover the cost of renting the room, with money left over being returned in PRIZES. There will be seven rounds; the rate of play is that each person has 5 minutes to make all their moves in each game plus 5 seconds for each move. We can provide all sets and clocks. The tournament is expected to finish between 10.30 and 11. Visitors to Galway are very welcome to come along and play. The July Blitz, held on Thursday 19 July, continued the recent tradition of being dominated by our junior players. (See the reports on the blitzes in April and May; we did not hold a blitz tournament in June.) Denis Ruchko dominated from start to finish, scoring 6½ points out of 7 (conceding only one draw, to Jason Rawlinson), to add the July title to those he won in April and May. Kynesha Ryder came second, as she did in April, with 5½ points. The rating prize was won, for the third time this calendar year, by Andrejs Kozlovs, though this is almost certainly the last time that he will be eligible for this prize, as his rating has now risen to almost where it should be. Galway Chess Club’s July Blitz will be held this Thursday, 19 July, at our usual venue, upstairs in the Galway Bridge Centre, St Mary’s Road. Please be there by 7.45 to register. As this is taking place outside our usual season, there will be an entry fee of €5: this is so that we can pay the Bridge Centre for the use of their room, with any money left over being returned in PRIZES. The standard format will apply: 7 rounds in total, and each player will have 5 minutes per game, plus a 5 second increment per move. The club will provide sets and clocks. 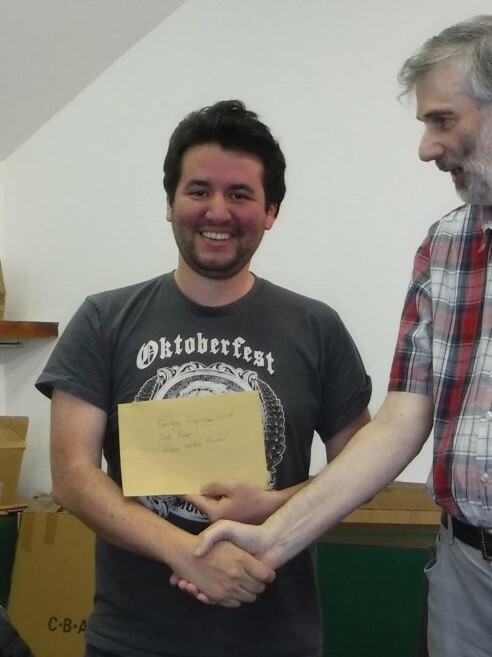 The annual Galway Rapidplay, held on Saturday 26 May, was won convincingly by top seed International Master Álvaro Valdés Escobar, from Chile. Álvaro won his first six games seemingly comfortably enough, before conceding a draw in his final game to finish on 6½ points. In second place was Irish champion Philip Short with 6 points: Philip lost to Álvaro in the tournament decider in round 5, and won all his remaining games. Whilst the first two places were decided quite early, the contest for the remaining prizes was a fierce one. Eventually they were shared amongst three players, all on 5 points: they were last year’s winner Colm Daly, Galway’s Denis Ruchko (who also won the junior prize for the third year in a row) and John Hensey from Westport (who also won the under-1500 rating prize). The highest placed female player was Kynesha Ryder, for the second year running. 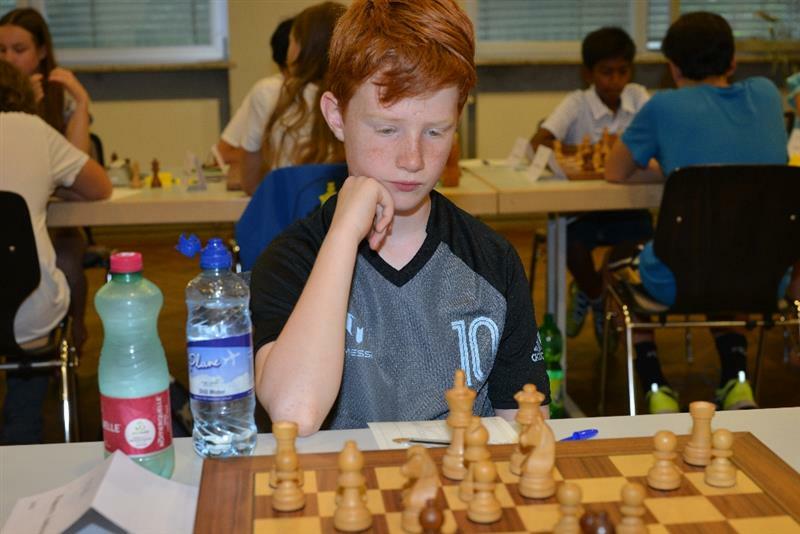 John’s performance was particularly noteworthy: not only did he finish third when seeded 25th out of 31 players, but in the last round he beat an Irish international rated over a thousand points higher than him. Whilst on the subject of giant-killers, mention must be made of Galway’s Zoran Dragic, who was rated flat last (based on a provisional ICU rating obtained in Bunratty) yet nevertheless ended up joint 6th, on 4½ points, beating no fewer than three players nominally rated about a thousand points higher than him. Full standings, crosstable and photos of prize winners are here. And here is the happy winner receiving his prize from tournament organizer Pete Morriss. The next weekend congress near to Galway will be in Ennis on the weekend of Friday 11 to Sunday 13 May. Further details are here. The May blitz, played on Thursday 3 May, proved another triumph for youth, with all prizes going to players under 17. First equal were Denis Ruchko and Zalan Nemeth on 5½ points: they drew with each other, lost one game each against the older folk (to Ger Abberton and Pete Morriss, respectively), and won all five of their remaining games. The grading prize was won, for the second month in a row, by Kynesha Ryder, with 4 points. There was an above-average size turnout, incidentally, which has encouraged us to keep the monthly blitzes going throughout the summer. Dates will be announced shortly. This year’s Galway Rapidplay will take place on Saturday 26 May, at the Bridge Centre, St Mary’s Road, Galway. (For directions to the Bridge Centre, see here.) The format will be seven rounds, with each player having 15 minutes to make all their moves, plus an extra ten seconds for each move. The event will start at 11 a.m. (prompt! ), and we expect that it will finish by 7 p.m. Full information about the tournament, including how to enter, is available in the Rapidplay 2018 tab above. Coffee, tea, and soft drinks will be available to purchase at the venue, and we expect to also provide sandwiches and other nourishment. We are looking forward to seeing you – if you have any queries please do ask us. Our next blitz tournament will be on Thursday 3 May, at the Bridge Centre (upstairs), St Mary’s Road. Start time is 7.45, and, as usual, it will consist of seven rounds with each player having 5 minutes per game for all their moves, plus an increment of 5 extra seconds per move. We expect the tournament to finish before 10.30, and all equipment will be provided. All standard of player – from experienced to beginner – are welcome; if you are interested in chess, and have maybe played on-line, but have never played in an over-the-board tournament, this would be an ideal opportunity to try it out in a friendly environment.